Looking for an easy and cost-efficient way to spruce up a tired looking bathroom? A new Glass Shower Enclosure is a practical and appealing way to turn your dream bathroom into a reality. With many styles and designs to choose from, it may feel overwhelming. Stouffville Glass can help you begin with a few easy steps. Serving the Greater Toronto Area for over 30 years. 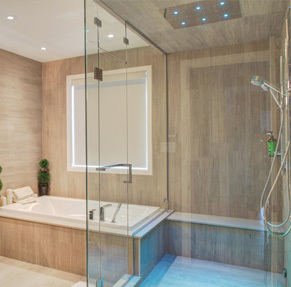 There are a few things you’ll want to consider when you’re selecting a shower enclosure or door for your shower. The wrong door can cause water damage through leakage. With all of the selection available to you, what’s the best way to determine the shower door that’s right for you? Space: evaluate the opening in your shower door area. Take into account the space and other fixtures in the area. Choosing a shower design that’s right for your taste and space. We have a wide range of tempered glass choices. Choose a modern look of a frameless shower or custom aluminum channels. We have something to accommodate any taste and we offer a 3-year guarantee on our hinges and hardware. Whichever you choose, we’ll help you from start to finish. We focus on quality and that’s why we give you a 1-year installation warranty. Our shower doors and panels are all constructed with clear, obscure, tinted tempered glass for quality and privacy if needed. All exposed edges are polished and rounded for esthetics and safety. Hinges are made of stainless steel or solid brass so you can trust that they will never corrode. We do all of the cutting, polishing and construction in-house to meet your custom requirements. We’re also an Authorized distributor for Maxx Collection, a superior brand that offers an impressive range of products to suit your bathroom upgrade, renovation or new build. All Rights Reserved ® Stouffville Glass Inc.